Earth Day is April 22, 2015. In observance of this event, and in the spirit of being a “Greener Campus,” on April 1st our office complex Chapel Bridge Park is implementing a single stream recycling program. 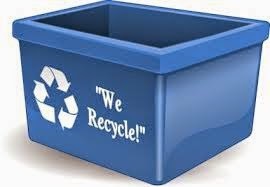 Our staff will be given small blue bins for under their desks, and we will be asking them to divert all recyclable materials into it. It’s easy – anything that can be recycled goes into one container. We're very happy to do our part!